A week after the renewal of one of Penn State’s oldest and most-played rivalries, the Nittany Lions face an opponent with whom they’re somewhat less familiar. The Eastern Michigan Eagles are making their third trip to Beaver Stadium, following two previous meetings that the Lions won by a combined 86-13. The first came in 1992, a 52-7 win early in Penn State’s final season before the start of Big Ten play. The last came two years ago, a 34-6 victory. Looking back at both of those one-sided affairs, we’re reminded of a couple of names from more recent history—last week, to be exact. Among the standouts in that ’92 blowout was Richie Anderson ’93, who ran for two touchdowns on the day and went on to play 12 NFL seasons. Last Saturday at MetLife Stadium, another Anderson—Richie’s son, true freshman wide receiver Richy Anderson—made his collegiate debut in the Lions’ 23-17 win over Syracuse. The younger Anderson continues the incredible legacy of brothers, sons, and even grandsons of former Nittany Lions to follow in familial footsteps. And then there’s Michael Mauti ’13, yet another of those legacy players—younger brother of Patrick Mauti ’09, and son of Rich Mauti ’89. A junior when EMU last visited Beaver Stadium two years ago, Mike Mauti (pictured above) had already overcome a torn ACL in his right knee in 2009; that afternoon, he blew out his left knee, an injury that forced him to miss the rest of the 2011 season. 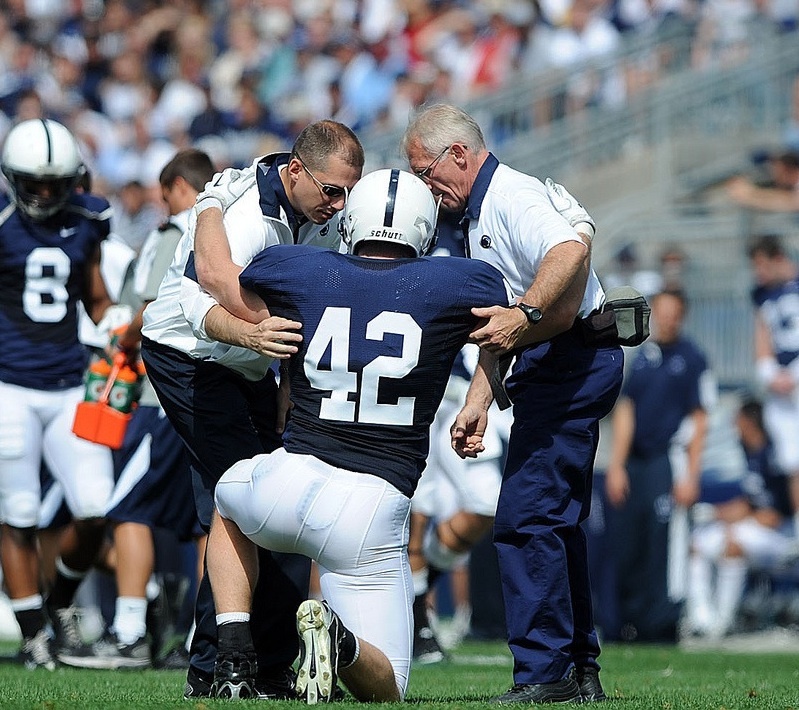 Of course, Penn State fans remember that Mauti suffered a third devastating knee injury last fall against Indiana; that injury not only ended his college career early, but left most assuming that his NFL dreams were surely dead. Last weekend, Mauti made the Minnesota Vikings’ 53-man opening-day roster. It was a great weekend for a number of former Lions who took the field against EMU two years ago: Mauti’s once and current teammate, Gerald Hodges ’13, also made the cut for the Vikings, while wideout Derek Moye ’11 earned a spot with the Pittsburgh Steelers, and Matt McGloin ’12 cemented his place with the Oakland Raiders. They’re among 25 former Penn Staters on NFL opening-day rosters. No doubt there will be a number of future NFL players in blue and white this weekend when the Lions once again welcome EMU. This entry was posted in From the Archives and tagged Derek Moye, Easten Michigan, Gerald Hodges, Matt McGloin, Michael Mauti, Patrick Mauti, Rich Mauti, Richie Anderson, Richy Anderson. Bookmark the permalink.